As with most of Lynch's work, music and sound plays a major part in setting the mood of the film. Twin Peaks is no exception. Much of the music, composed by Angelo Badalamenti, is available on CD and tape. In addition to the actual soundtracks, other songs used in the series and film can be found on Julee Cruise's two albums. "The Nightingale", "Into the Night" and "Falling" were featured in the Twin Peaks pilot. "Rockin' Back Inside My Heart" and "The World Spins" were featured in episode 14. "Questions in a World of Blue" was featured in Fire Walk With Me. 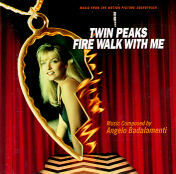 In addition, much of the music from Fire Walk With Me was reused with new vocals added. 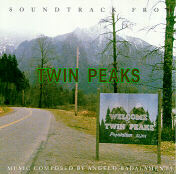 "Falling" by Julee Cruise from "The Voice of Love" and the Twin Peaks soundtrack, was released as a CD and cassette single at the height of TP mania. She also performed it live several times, including on Saturday Night Live and in the Twin Peaks pilot. Cassette single photo courtesy Yvonne Choi.